Diwali is one of the brightest and most celebrated festivals in all of India. 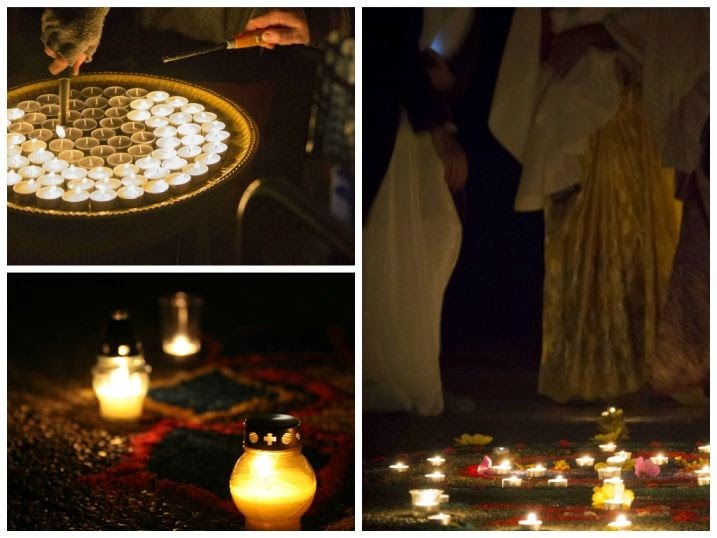 Known as “the festival of lights,” Diwali is a time when elaborate decorations are created, family and friends get together, and most of all, the Divine is worshipped and loved by millions of people. 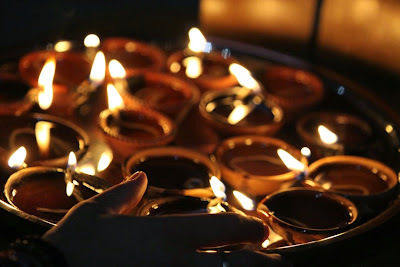 Part of what makes Diwali so unique, is that it is a holiday which has many parallels between faiths. For example, both Jains and Sikhs celebrate their own festival of lights, showing that the light which is in us all originates from the same essence. In India itself, the meaning and context behind Diwali differs region by region, but nonetheless, the underlying principle is parallel. In North India, Diwali is the celebration that marks Lord Rama’s return to Ayodhya after he vanquished the demon Ravana and rescued Sita. In South India, Diwali commemorates the defeat of the demon Narakasura, the demon that Krishna valiantly slayed. In western India, the festival celebrates the day that Lord Vishnu sent the demon King Bali to rule the nether world. In eastern India, such as in parts of Bengal, Diwali celebrates the victory of Goddess Kali over the demon Bakrasura. No matter what the area is, Diwali glorifies the victory of good over evil, the victory of the heart over the mind. In addition to the universal appeal that Diwali represents, Diwali contains numerous characteristics that personify the holiday. Have you heard the saying, “Lights. Camera. Action.”? Well on Diwali, it’s more like, “Lights! Lights! Lights!” From setting off flashing fireworks, building blazing bonfires, and lighting the luminous clay earthen lamps, Diwali is all about the lights. 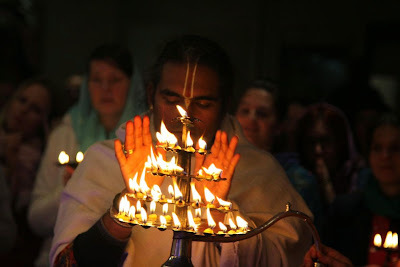 As it is celebrated throughout the night, Diwali is a time to remember that out of the darkness of ignorance, the light of God will reveal itself. This is the true light that is hidden within each and every person. Diwali is a festival that is comprised of five days, with the third day being the main festive day. Dhanteras, sometimes called “the festival of wealth,” marks the first two days of Diwali and is dedicated to Maha Lakshmi, Kubera, and Dhanvantari. 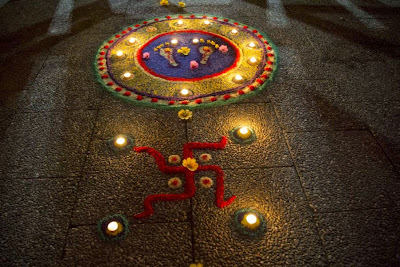 Traditionally on Dhanteras, houses and businesses are cleaned, decorated, and improved, and the entrance ways are adorned with a classical style of art called Rangoli. Made with materials such as coloured rice, dry flour, coloured sand, flowers, and more, Rangoli is an art which is found throughout India and is a significant part of the Indian culture. 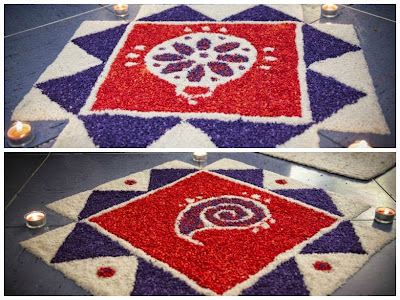 With many other epithets, such as Muggu or Kolam, Rangoli designs take on diverse patterns as each part of India has their own style and design. 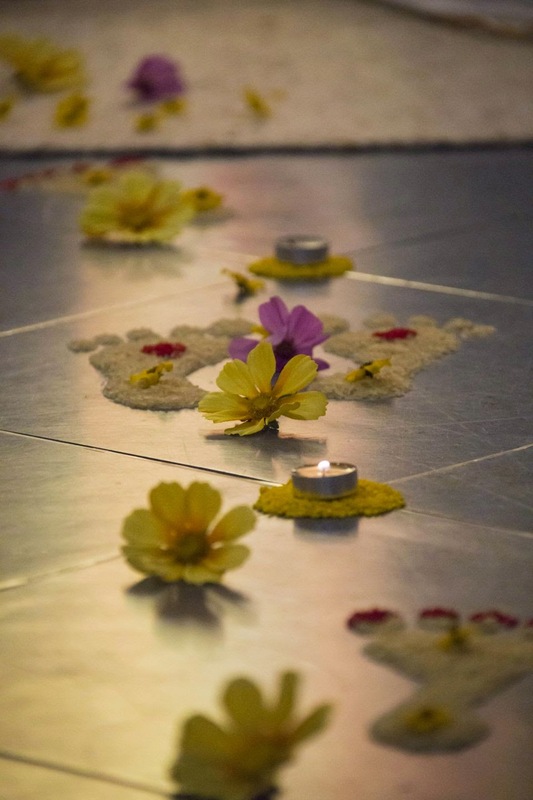 Rangoli is an art that truly has become an outlet for service and devotion. The length of time and dedication that it takes to make the complex geometrical forms is remarkably substantial. On Diwali itself, one of the common Rangoli designs is the Diya, or Deep, which is an illustrated version of a lamp. As it is believed that during Diwali, Maha Lakshmi Herself travels around the Earth searching to see where She is welcomed, oftentimes people leave their doors and windows open to offer a gesture to Maa for Her blessing. It is also a custom to make Rangoli designs of Maha Lakshmi’s footprints on the pathway leading towards the entrance, as it indicates Her arrival. 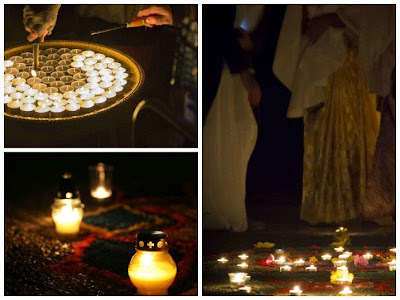 All in all, Diwali is truly one of the most spectacular holidays found in the Hindu culture and it has spread across the world to places like Australia, Europe, the United States, and more. It symbolises the significance of what it means to let the light within us all shine bright for the whole world to share. Diwali is a time to remember that the light is not only all around us, but it is, by nature, who we actually are. We are all manifestations of Divine Love.